What’s happening in UNHAPPY VALLEY right now is likely to turn into the biggest and most disgusting off-the-field scandal in college football history. And that friends and fans, is saying something...something really awful. 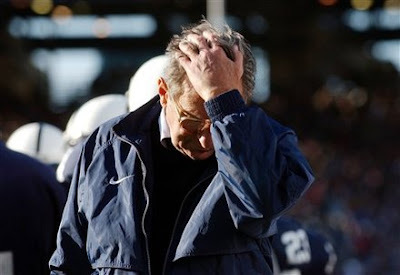 We have long held Joe Pa in high esteem, but the Jim Tressell’ “I didn’t know defense” isn’t going to fly here at T.A.H. Worldwide Media Headquarters LLC. And it shouldn’t fly anywhere else either -- even in the biggest PSU fans’, grads’ and boosters’ houses. Anybody...read that ANYBODY, who sees a grown man naked in a shower with a ten-year-old boy should immediately launch an investigation. Or, how about this, just pick up the phone AND CALL THE EFFING POLICE! It would have been just plain weird if it was his own son, but since it wasn’t everybody at PSU with knowledge of the incident needed to take some sort of action. You choose. Call 911, disgrace and fire the guy -- pick your poison, but you have to do SOMETHING. And, that something isn’t cover it up. Did we mention, that "something" should be to pick up the phone and CALL THE EFFING POLICE! It’s a naked grown man and a kid in a shower!!! Seriously, is that how it went? Because short of calling the cops, how the HELL else could that post-incident conversation have gone? While we won’t declare Joe Pa, the assistant coach who saw the “alleged” incident and the A.D. (and many are now calling for the school president’s head) guilty until proven innocent, if they covered up a sexual abuse crime (or a series of said crimes) to cover for an assistant football coach, jail time seems appropriate. Even for the legendary one. To read more about this sordid mess, click here. 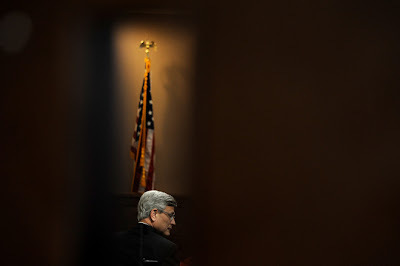 UPDATE: N.Y. Times saying Joe Pa on the way out - click here.